Magnetti Building is always ready for new challenges to bring expertise and know-how in the sector of contemporary construction. This is demonstrated by the close partnerships with the Università di Genova, the Politecnico di Milano and SUPSI – the University of Applied Sciences of Southern Switzerland, in Lugano. Carvico (Bg), 21 marzo 2019 – For Magnetti Building, a Bergamo-based company specialising in prefabrication, building solid, long-lasting partnerships with universities means getting to know the most important schools in order to offer the most deserving students professional and tailor-made training opportunities, as well as working in synergy in the sector of Research & Development. The precious partnerships with the Università di Genova, the Politecnico di Milano and SUPSI – University of Applied Sciences and Arts of Southern Switzerland, based in Lugano are the results of this double soul, divided between education and research. The Acqua-Stop® construction system, consisting of a continuous TPO covering fixed to the roof by electromagnetic induction, without drilling holes, is the result of collaboration with the Department of Structural and Geotechnical Engineering of the Università di Genova.This solution, smooth, clean and pleasing to the eye compared to traditional covers, also offers a high resistance to weathering and limits the absorption of heat in the summer months, for greater living comfort. Acqua-Stop®, stable and non-toxic, adapts perfectly to any structural movement and is also completely waterproof and can be integrated with photovoltaic systems. In addition, the durability of the material, proven by the British Standard, guarantees a life expectancy of about 25 years. The close relationship established with the Politecnico di Milano is fundamental for Magnetti Building. From this partnership, in fact, the “Tegolo Project” was launched for the creation of new roofing elements for large spans developed for a job order that will soon go into production. The experience gained through the EASEE project – Envelope Approach to improve Sustainability and Energy Efficiency – for which Magnetti Building and the University of Milan have studied and implemented innovative prefabricated solutions for the energy requalification of buildings built before 1975, is also significant. The panorama of partnerships with universities is closed by the collaboration with the Department of Environment, Construction and Design of SUPSI – University of Applied Sciences and Arts of Southern Switzerland, which also includes among its teachers the designer of the Bahrain pavilion, designed by Magnetti Building for Expo 2015. Magnetti Building is always at the University’s disposal also for research projects inside the university, such as, for example, experimentation on the breaking point of the panels. “Magnetti’s welcome made us feel at home, and Carvico’s centre of expertise taught our students the art of precast reinforced concrete. – says Giuseppe Rossi, SUPSI architect and teacher – On 8 May 2018, 48 SUPSI students, second year Bachelor of Architecture degree course, took the opportunity to visit the factory of the company in Carvico. Deepening the logic and places of prefabrication was a didactic experience in tune with the learning strategies of a discipline eager for true and technological innovation”. 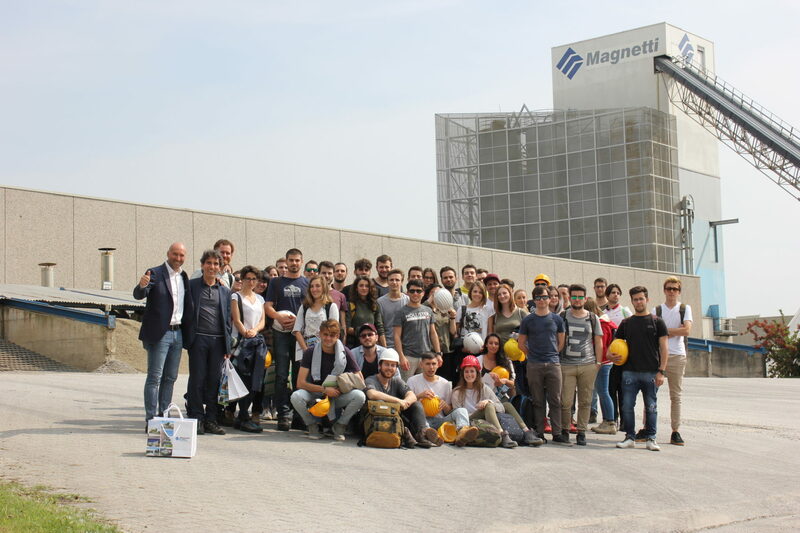 In fact, Magnetti Building provides for the architectural classes of the various universities to visit their factory to learn more about the world of work and prefabrication. In this way, the company confirms itself as a dynamic reality, constantly looking for new competent and professional resources that, with a spirit of initiative, can be integrated into the team, during training periods and in Employer Branding activities. Partnerships with the University are clear signs of the company’s propensity for constant innovation, which brings new experience to emerging areas of prefabrication, such as the sector of redevelopment and custom components for construction and modern architecture. Would you like further information or to speak with a consultant? I hereby declare to give my consent to the processing of my personal details as of the informative statement relating to the sending of commercial, promotional and/or advertising material.